Data warehouses are constantly evolving to support new technologies and business requirements – and remain relevant when it comes to big data and analytics. 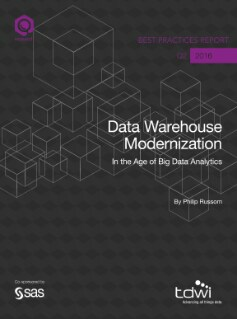 Regardless of how new or sophisticated your data warehouse is, it likely needs modernization. This TDWI Best Practices Report explains what data warehouse modernization is and why it’s important, including benefits and barriers to making it happen. The report examines best practices and data warehousing trends to follow when planning modernization projects. Learn the top 12 priorities you must consider for a successful data warehouse modernization.